I realize that it must seem like I am obsessed with pasta. That makes sense, because I AM! It is so easy to make and I think it tastes so fantastic. Last week I made the wonderful penne that I posted about, and this week I do believe I made something even better! An awesome thing about pasta is that you can use any shape pasta to change it up. Prepare pasta as directed on box. Put chopped onion into pan and cook until onions get flimsy. Add garlic and Italian seasonings. Once onions are a little less crunchy pour in both jars of sauce. Once the sauce starts to bubble (not a lot, just until its warm) add the pasta back to the pot. If you want to, you could add a big amount of Parmesan to the pot, but I just sat the jar on the table. 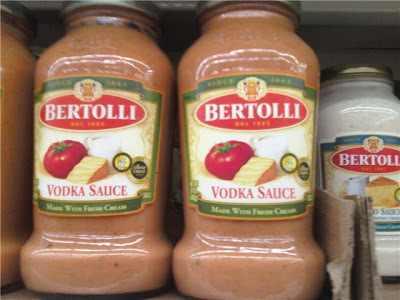 Definitely use it though, it thickens up the sauce and makes it a million times better. Do not skip the parm. Eat it up. This stuff rocks. 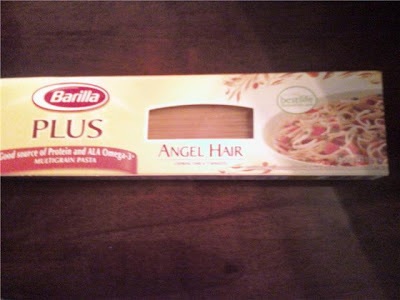 I used this pasta, you can use anything you want though. The multi-grain pasta tastes very similar to white pasta. I was reading the back of the sauce jar while I was eating (for some reason, Josh always sleeps on the nights I make the best food) and I noticed that it isn't the healthiest. It actually has quite a bit of fat in it (not a huge amount, but enough). 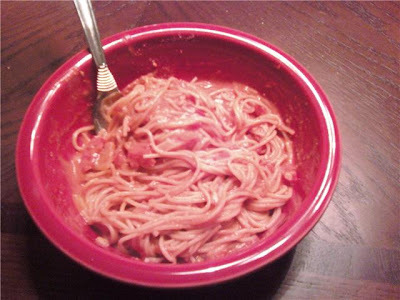 Side note: it may be difficult to tell in these pictures, but the sauce is a creamy red color, almost a orangish/pink. One thing I've changed about my diet is that I'm not watching all the nutritional facts as close as I used to. Now it seems easier to eat in moderation (except for this meal..it was so hard!). I've been keeping much more fresh fruit in the house though to snack on. Truth is, you CAN lose weight and still eat whatever you want, just in moderation.